First up we have a compamy/trailer skin for Borje Jonsson. This was originally posted on the 2nd but I forgot to put the blog up. Go me. However it has since been updated since then and is now green (the picture I was given made it impossible to tell the actual colour) as it should be. A Cab skin will follow shortly. 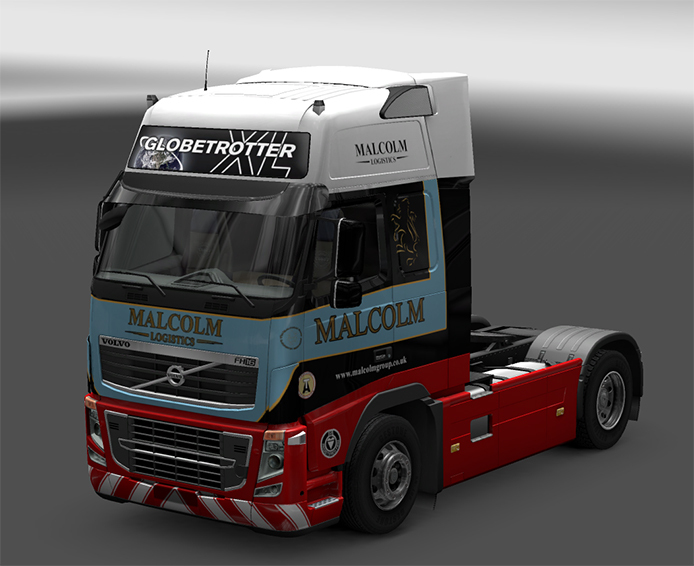 We now also have a Malcolm on the Volvo FH/16. Although the original Malcolm design would have the blue side bar stop where the white of the roof starts, it really didn’t look right on this Volvo. So I’ve used a bit of creative license and carried it up onto the side of the roof. So I have decided to update the BSM a little bit. First thing to note is that I have removed some compost cargo as I felt it didn’t seem right being despatched/received by certain companies. It is unlikely that this will cause any issues for you if you happen to be pulling the cargo, however it is still suggested to finish any runs you are on before updating the mod. Always better to play it safe. I have also added a new Tesco trailer to the mix. As always; see the changes page for a full list of updates. 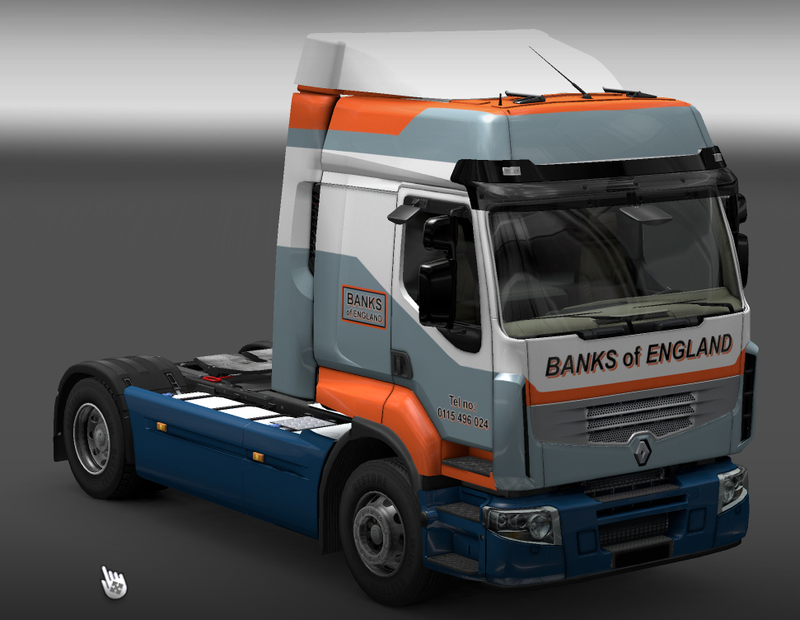 By request we have a fictional skin based on Banks of England from the BBC show Truckers. First of all I would just like to thank those of you who have donated, we have made £13 so far. The site has now been updated to include a Pollock trailer and Renault Magnum skin. So with Children in Need coming up in a couple of weeks time I thought it would be nice to offer a CIN skin for people wishing to donate to the charity. The [name] will of course be changed to your name/nickname. The trailer is a stand alone trailer and does not replace any company. It will pull the following cargo: Clothes, Fizzy Drinks, Electronics, Packaged Foods, Medicine and Toys. It will deliver to/from the following companies: Eurogoodies, Kaarfor (in only), Posped, Sellplan (in only), Stokes, Tradeaux, Trameri, and Transinet. Please note: The mod is compatible with game version 1.4.1 and above, it will not work on any older version. How long will this be open & what happens to the money: This year the Children in Need BBC TV event will take place on Friday 15th November. On the morning of Saturday 16th, I will be removing the donation instructions and sending any/all donations to the official Paypal of Children in Need. When will you receive the trailer: I will endeavour to complete and email your trailer within an hour of receiving payment, assuming you send payment between 10am-10pm GMT. Will you make charity skins in the future: That really depends on how well this works. The more interest there is, the more likely I will do it in future for other charities. For any donation of 50p or over you will receive this Children in Need stand alone trailer with your name/nickname on it. Follow the instructions below if you would like to make a donation. IMPORTANT: Make sure you fill in the email form and include the following: The name you wish to appear on the trailer & the email address where you want the trailer to be sent. If you would like to donate but have no interest in the trailer; please donate directly to Children in Need via the BBC website. A quick note on the new Phoebe Grace Volvo skin, the “stobartgroup.com” text was the wrong shade of green and has been updated to make it the correct shade. New addition of a Malcolm Logistics Volvo (classic FH16).